Saturday, October 12th, 1889. VISIT TO LEIGH. Some twenty members visited Leigh to inspect the various objects of antiquarian interest which are to be found in and around this district. The rendezvous was at Glazebury, and here the party were met by the Rev. J. H. Stanning, M.A., vicar of Leigh, who acted as leader. The members were then conveyed to Newchurch Church, Culcheth, where they were met by the Rev. Dr. Black. The church is notable on account of Thomas Wilson, afterwards Bishop of Sodor and Man, being the curate here at one time, the rector being his uncle, Dr. Sherlock, of Winwick. It contains a brass inscription regarding the Holcroft family, and the registers record the marriage of the notorious Colonel Blood, who, in 1671, attempted to steal the regalia from the Tower of London. It was intended to visit Hope Carr Hall, but this was abandoned as there was not time. On arriving at Leigh the party proceeded to the parish church. Mr. J. E. Worsley, F.S.A., in the course of a paper, read in the Leigh Parish Church, on Sir Thomas Tyldesley, stated that immediately under his feet, where he was then standing, rested the mortal remains of a Christian, a hero, and a gentleman, over whose neglected grave hundreds of heedless feet had passed, until his resting place at length became a matter of tradition, handed down here from father to son, and in 1869, to the best of his belief, known almost to one man only, a curious old man who was clerk and sexton there. That old man often showed him (Mr. Worsley) where Sir Thomas was believed to be buried. The north aisle was then filled with pews, and, except the beautiful ceiling, had left in it few traces of the old chantry chapel of St. Nicholas, before the site of whose altar the hero's bones lay with those of some of his long line of ancestors. Here for some years he lay forgotten and unrecorded by the little world of Leigh. It was recorded that James, seventh Earl of Derby, when in Leigh on his way to his place of execution at Bolton, wished to visit the grave of his old comrade in arms, but was not permitted to do so. Upon the rebuilding of the church the tradition of the burial place was not forgotten, and as the excavations proceeded great care was taken, with the result that the body of Sir Thomas was discovered. He (Mr. Worsley) was informed of the discovery by a letter written to him by Mr. Passe on the 28th December, 1870, who stated that a large oak coffin, six feet two and a half inches long, and one foot and a half wide, containing the skeleton of some tall and well-formed person, had been found. A similar coffin, five feet eleven inches long, and some fifteen inches wide, was also found near the other, but there was no plate or inscription on either of them. When the restoration of the church was completed a subscription was raised, and by it the brass plate now inserted in the north wall of the chapel was put up. The arms in the margin of the brass are Tyldesley quartering Worsley, brought in by the marriage of Thurston de Tyldesley with Margaret, daughter and heiress of Jordan de Workedeslegh or Worsley, tempo Edward II. ; and Leyland of Morleys, brought in by the marriage of Edward Tyldesley with Ann, daughter and sole heiress of Thomas Leyland of that family, tempo Henry VIII. The following is the present inscription on the brass plate in the Leigh Parish Church: "At the east end of the north aisle, formerly the Tyldesley chantry of St. Nicholas, within this ancient parish church, rested the body of Sir Thomas Tyldesley, of Tyldesley, Morleys, and Myerscough, in this county, knight, a major-general in his Majesty's army, and governor of Lichfield, who was slain fighting gallantly for his royal master under James, seventh Earl of Derby, in the battle of Wigan-lane near this place, on the twenty-fifth day of August, 1651." Thus, after a lapse of over two hundred years, had a memorial to him been placed in the church. But Sir Thomas had made for himself a memorial more lasting than brass. Major Edward Robinson, of the Parliament army, speaking of Sir Thomas, said: "There was not a man in all the country more zealous a servant for the king's part than Colonel Tyldesley, who was a noble and a generous-minded gentleman." It had been well said by one of the biographers of Sir Thomas that he was one of those cavaliers whose deeds were more suited to the pages of a romance than those of history. He was a soldier, and had seen foreign service, and at the beginning of the great Civil War he raised a troop of soldiers for the king at his own cost. He commanded at the storming of Burton-upon-Trent, when the town was stormed over a bridge of thirty-six arches. For this he was knighted by the king and made a brigadier. He fought as lieutenant-colonel at the battle of Edgehill, and was taken prisoner in 1644 at Montgomery. He was at the taking of Bolton under the Earl of Derby, and was in command at the siege of Lancaster. He was governor of Lichfield during its celebrated siege. After the execution of the king he served the royal cause in Ireland under Ormonde, and then in Scotland. He fell at last in the fight in Wigan Lane, whilst endeavouring, with the Earl of Derby, to carry out an act of the greatest daring. The device on his banner was an eagle feeding her young ones from blood flowing from her own breast, surrounded by a wreathed border with the motto: "Regis et patriae tantum valet amor" ("So greatly avails the love of king and country"). A monument commemorative of the fall of this brave soldier was placed, in 1679, about a quarter of a mile to the north of Wigan, in the hedge fence, on the spot where the engagement took place, and where he received his last wound; and upon a brass plate thereto affixed is the following inscription: "An high act of gratitude which conveys the memory of Sir Thomas Tyldesley to posterity who served King Charles I. as lieutenant-colonel at Edgehill battle after raising regiments of horse, foot, and dragoons, and for the desperate storming of Burton-upon-Trent over a bridge of thirty-six arches, received the honour of knighthood. He afterwards served in all the wars with great command. Was governor of Lichfield, and followed the fortune of the Crown through three kingdoms, and never compounded with the rebels, though strongly invested; and on the 25th of August, A.D. 1651, was here slain commanding as Major General under the Earl of Derby, to whom the grateful erector, Alexander Rigby, Esq., was cornet, and when he was High Sheriff of this county (A.D. 1679) placed this high obligation on the whole family of the Tyldesleys to follow the noble example of their loyal ancestor." The family of Tyldesley derived its name from the lordship of Tyldesley, anciently part of the Leigh parish, and the pedigree commenced with Henry de Tyldesley. His grandson, Thurston, acquired Wardley, in Worsley, by his marriage; and his son, Thomas de Tyldesley, was serjeant-at-law to Henry IV. From Thurston descended, in the fifth generation, Thomas Tyldesley, who was receiver-general to Thomas, Earl of Derby, and his son, Thurston, was, in 1532, receiver-general for the Isle of Man. His son Edward acquired Morleys, in Astley, by his marriage, and from him descended in the second generation Edward Tyldesley, of Tyldesley, Morleys, and Myerscough, who entertained King James I. at Myerscough on his progress through Lancashire; and Sir Thomas, our hero, was his eldest son. Of the descendants of Sir Thomas, his son Edward, who married Ann, daughter of Sir Thomas Fleetwood, was one of those royalists whose names were on the list for the intended order of knighthood of the Royal Oak, and who suffered, as did all the adherents to the Stuarts, from neglect and ingratitude. His son married Mary, daughter of Alexander Rigby, son and heir ot the erector of the monument in Wigan Lane; and his son Thomas, following the traditions of his family, joined Prince James in 1715. On the defeat of the Pretender he was tried for high treason, but acquitted. His son, James Tyldesley, again proved his loyalty to the Stuarts by serving Prince Charles Edward in 1745, and with him the prosperity of the family ended. The chantry chapel of St. Nicholas, called the Tyldesley Chapel, in which Sir Thomas lies buried, is believed to have been erected at the same time as the tower, namely, at the end of the fifteenth century. The roof is all that remains of the building. Mr. Worsley after expressing his belief that the chantry was built by Sir William Leyland, of Morleys, knight, concluded his interesting address by pointing out that now, under a constitutional government, they were able to realise Sir Thomas Tyldesley's motto. The Vicar said he might take the opportunity of saying a little to them about the parish church, which was, at any rate, quite distinct from the parish of Leigh. There was nothing old at the church with the exception of a few things which he had pointed out, except the brass to Henry Travice, of Light Oaks. To Mr. Worsley, he ought to say, they were indebted for the brass to Sir Thomas Tyldesley in the north wall. He took the matter in hand, got subscriptions, and they had the result in the brass they saw. And he might call their attention to the way in which it was placed in the wall, which was one of the best methods he had seen. Mr. Worsley, too, was the historian of the parish church of Leigh, and he had written a small book dealing, as far as was known, with the history of the parish church of Leigh. There were a few further particulars which he (the speaker) had obtained, though they did not go any further back than what Mr. Worsley had been able to go. They did not know the first date of the preaching of the gospel there, or of the first building of the church. Mr. Paley, the architect of the present church, believed the old one to have been built as early as 1616, in fact the figures 1616 were found on a principal of the old roof. The old church was not quite on the same site as the present one, which had been moved northwards. The old nave was very much narrower, and the old floor was eighteen inches below the present one. There was nothing interesting in the old church except the Tyldesley Chapel and the Atherton chantry. The latter was given up by Lord Lilford when the church was rebuilt twenty years ago. 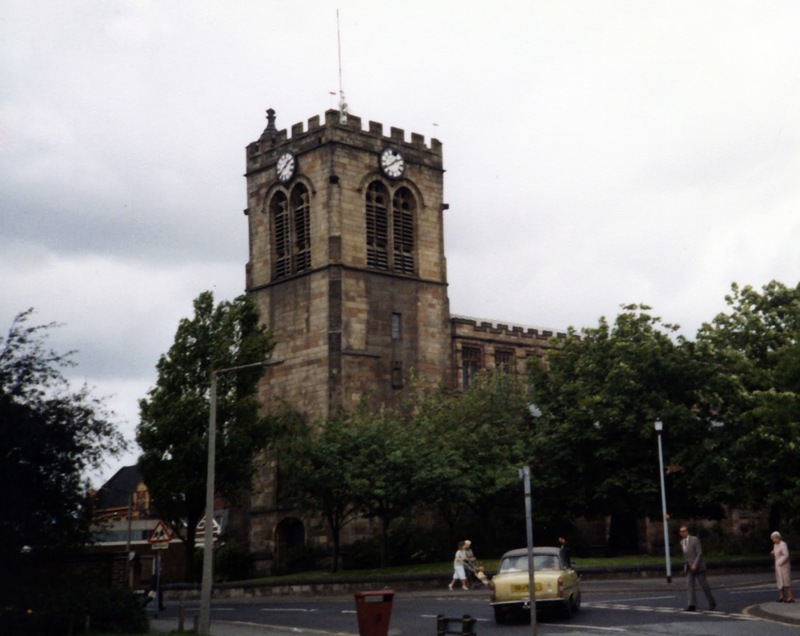 The first reference to Leigh church they could get at was 1264, when on the 29th of January of that year a complaint was made by the Bishop of Lichfield and Coventry, he seeking the king's aid against certain parties who had seized the churches of Leigh, Bury, and Winwick. Leigh was in the diocese of Lichfield and Coventry before the time of the Reformation, when it was taken out of the old diocese and put in the newly-formed diocese of Chester. In later years it became a question whether Leigh should be left in the old diocese of Chester, or put in the new diocese of Manchester. The late vicar was a man who had many fights with his bishop about various things, and when he was asked by the Bishop of Chester which diocese he preferred, he answered that he preferred to be near his bishop ; therefore he would be in the diocese of Manchester. The bishop replied that the late vicar might not always think it an advantage to be near the bishop. It was put in the diocese of Manchester, but when the diocese of Liverpool was formed it became a question whether Leigh should be in the new diocese of Liverpool or not. This ancient parish is in the hundred of West Derby, the only portion of that hundred not in the diocese of Liverpool. He thought it would be much better if ecclesiastical and civil boundaries coincided. There had once been litigation touching upon the right of presentation. In the course of it there was a certain charter of Richard de Urmston referred to, and in that reference was made to the church as dedicated to St. Peter. When the church was rebuilt it was dedicated to St. Mary the Virgin, he (the vicar) being under the impression at the time that the old church was dedicated to St Mary. In the old days the church was over and over again called the Church of Westleigh. The ancient parish of Leigh comprised six townships, viz., Astley (or East Leigh), Tyldesley, Westleigh, Atherton, Pennington, and Bedford. The church itself stood in two townships, the body of the church being in Westleigh and the chancel in Pennington. One other curious fact was that in 1450 the Bishop of Lichfield and Coventry was a William Booth— one of the Booths of Barton—and he was previously the rector of Leigh. In the old church the extraordinary custom of cursing by bell, book, and candle was observed in 1474. It was in connection with the forging of certain deeds. One Sunday there came a man named Nicholas Rylands, who took an oath that the deeds were not forged. The vicar cursed him, if he was guilty, by bell, book, and candle,, and, as the candle went out, the vicar cursed those who had aided Rylands in forging the deeds. In the seventeenth century a complaint was made about the rabble outside throwing stones on to the roof of the church and disturbing the congregation. About 1693 the parishioners of Leigh thought it desirable to add a fifth bell to the four old ones, and this was done. It was stated that Queen Elizabeth caused the other four bells to be hung. To defray the cost of the fifth bell, which was £60, a call was made on each of the six parishes to contribute £10. They had now a peal of eight bells, varying from ten to twenty-one hundredweight in weight. With regard to the new work, he might mention that they had put in the east window within the last month, and they hoped by this time next year to have a reredos and also a chancel screen, when the work in the church would be getting more complete. The vicar then conducted the visitors into the vestry, where they were shown the church registers dating from 1597, two books which at one time were chained in the church ; a piece of wood taken from the roof bearing the figures 1616, and three old constables' staves. Afterwards the Grammar School was visited, and the various matters of interest explained by Mr. Ward, the headmaster. In the lower portion of the school was a man trap, the property of Mr. Richard Barton, of Westleigh Lodge, and an unique book-case for the school library, a brass plate attached having on the inscription, " All left of the books given to the Grammar School of Leigh by Ralph Pilling, master from 1699 to 1726, are placed herein." The books referred to were placed on the desks of the upper school for inspection. Mr. James Ward referred to the history of the school and the school library. The date of the foundation of the school has never been correctly ascertained. The earliest reference was in the will of Mr. James Starkie, a tailor of Pennington, who was buried in Leigh Churchyard in June, 1614, and who bequeathed 40s. towards a free grammar school for Leigh. There are records of a Mr. Worthington being master in 1641-2. Then one Symon Karsley was schoolmaster, and was succeeded by John Battersbie. Mr. Battersbie was probably the first master under a regular endowment by Mr. John Ranicar, of Atherton, who by will dated 16th August, 1655, left a yearly sum of arising out of two pieces of land in Leigh, called the Black Fields. A further endowment of £6 per annum, secured on the corn tithe of Pennington, was added in 1681 by Mr. Richard Bradshaw, of Pennington, who had previously given a house to keep the school in, and whose name was written in several of the volumes in the library. To Mr. Ralph Pilling, who became master in June, 1699, they were indebted for the library. In 1722 Ralph Pilling gave the yearly interest of £10 for an annual sermon in Leigh Church upon New Year's Day. Previous to the election of Mr. Ralph Pilling, a Mr. Samuel Simpson was master. Succeeding Mr. Pilling was John Norris, of Bolton, and in 1736 Thomas Barn, of Pleasington, occupied the master's chair. During the present century the following have successively held the mastership:—T. Hodgkinson, A. Hargreaves, Rev. James Simpson, Rev. Joseph Finlinson, Samuel Twist, R. W. A. Scott, B.A., Robert Wilson, and Mr. Ralph Passe, the late respected master, who was appointed in 1863 and resigned at Christmas, 1885. Mr. Ward afterwards went on to refer to the school library. He said that forty-eight volumes of Heskin's library still remain, but they have been much mutilated, only one or two being perfect. Many of the books were probably given after the completion of the new schoolhouse in 1719. They were indebted to Mr. Rose for rescuing that library, for he cleaned and examined the books and published in the Leigh Chronicle* Scrap Book an annotated catalogue, which unfortunately was not reprinted. Mr. J. E. Bailey also materially assisted in the work. The library now consists of about one hundred and twenty volumes, most of them in bad condition. A suitable bookcase had been provided for the books in response to an appeal made to the old boys by Mr. Rose, and the books will be therein placed, along with several old documents relating to the school. The lecturer concluded by noticing the books of special interest. At the close of the paper, Mr. Nicholson proposed and Captain French seconded a vote of thanks to the vicar and the readers of papers, which was carried with acclamation. A meeting was held after tea, when Mr. Stanning, as chairman, opened the business, and in doing so referred to the Holcrofts, of Holcroft, as being at one time a powerful family. He called the attention of the visitors to two pictures which were hanging on the wall, and which illustrated Leigh Church and Market Place as they used to be, the avenue and the old Atherton Hall, which he said cost £60,000 to build. The frontage of the old hall was one hundred feet, the great hall forty-five long by thirty-six feet, and some of the rooms were also very large. The old church, he said, used to be a very low building, and the tower, which was now standing, appeared to be very tall, but now that the body of the church had been raised the tower looked considerably less. A paper by Mr. Josiah Rose, on the Old Time Associations of Leigh, was afterwards read by Mr. William Norbury. The members then paid a visit to the Literary Society's Rooms and Reference Library. * See Christie's Old Lancashire Libraries, p. 182.